Turkey offers a beautiful selection of destinations for yoga sailing holidays in the Mediterranean. The Daily Itinerary begins with a yoga class in the morning followed by a very healthy breakfast. Then everyone has time to do as they wish. Then lunch is served, again with good wholesome fresh foods, with a leisure time afterward to go swimming, other water sports, or go ashore and explore. Private yoga cruises in Turkey provide a 5 o’clock tea break and more leisure time until the late afternoon, early evening yoga class, followed by a dinner. Just about all of our itineraries are suitable for yoga cruises as you will find that they all have peaceful destinations with a mixture of ancient ruins, turquoise bays, hidden coves, and private wooden piers near charming villages – not to mention great food and plenty of other activities to do. Each yoga sailing cruise runs from Saturday to the following Saturday embarking from the lovely harbor of Marmaris, Turkey. Among the many itineraries, the Marmaris – Gulf of Hisaronu – Marmaris is highly recommended. However, if you prefer to have plenty of archeological site visits, then a Marmaris – Fethiye – Marmaris route is suitable as well. 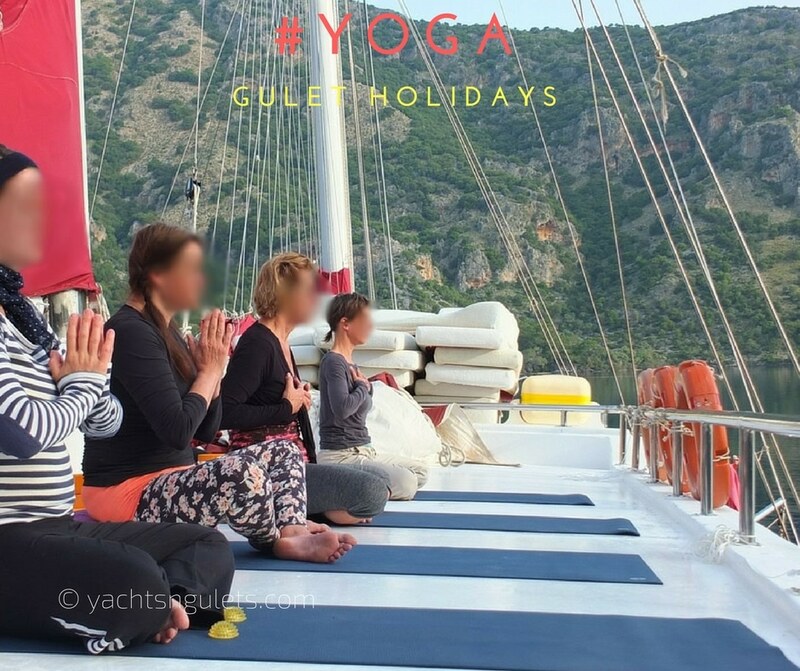 When Are Yoga Gulet Cruises Available? These beautiful gulet cruises run starting from mid-April until the end of October. When deciding on what time of year would be ideal, you may wish to keep in mind that the months of July and August are considered the hottest months with the most boat traffic, and when the seas are a bit rough due to the Meltemi winds, particularly in the Aegean Sea region. This is not a CABIN charter yoga cruise; it is for private group bookings. When you decide to inquire or book, a highly skilled, certified Yoga teacher is designated for your cruise period. All mats and necessary equipment are provided. You simply choose the gulet you wish to hire and leave the rest up to us! In order to send you offers, please specify your weekly budget and how many will be in your group. All offers will include food menu suitable for yoga classes, soft drinks, and airport transfer, as well as the standard gulet charter terms.